"Full English" redirects here. 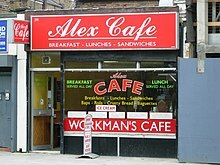 For the television series, see Full English (TV series). For other options, see The Full English. "Eggs and bacon" redirects here. For the plants, see Eggs-and-bacon. A full breakfast is a substantial cooked breakfast meal that typically includes bacon, sausages and eggs, and a beverage such as coffee or tea. It comes in different regional variants and is referred to by different names depending on the area. 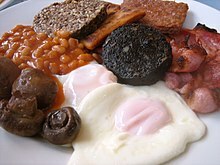 While it is colloquially known as a “fry up” in most areas of Britain and Ireland, it is usually referred to as a full English breakfast in England (often shortened to "full English"), and therefore, as a "full Irish", "full Scottish", "full Welsh", “full Cornish”, and the "Ulster fry" in the Republic of Ireland, Scotland, Wales, Cornwall, and Northern Ireland, respectively. It is especially popular in Britain and Ireland to such an extent that many cafes and pubs offer the meal at any time of day as an "all-day breakfast". It is also popular in other English-speaking countries, particularly countries that were a part of the British Empire. On its origin, Country Life magazine states, "The idea of the English breakfast as a national dish goes right back to the 13th century and the country houses of the gentry. In the old Anglo-Saxon tradition of hospitality, households would provide hearty breakfasts for visiting friends, relatives and neighbours." The full breakfast is among the most internationally recognised British dishes along with such staples as bangers and mash, shepherd's pie, cottage pie, fish and chips, roast beef, Sunday roast and the Christmas dinner. The fried breakfast became popular in Britain and Ireland during the Victorian era, and appears as one among many suggested breakfasts in home economist Isabella Beeton's Book of Household Management (1861). A full breakfast is often contrasted (e.g. on hotel menus) with the lighter alternative of a continental breakfast, consisting of tea or coffee, milk and fruit juices with bread, croissants, bagels, or pastries. "English breakfast" redirects here. For the tea, see English breakfast tea. The traditional full English breakfast includes bacon (traditionally back bacon), fried, poached or scrambled eggs, fried or grilled tomatoes, fried mushrooms, fried bread or buttered toast, and sausages (also known as "bangers"). Black pudding, baked beans, cooked tomatoes, and bubble and squeak are also often included. In the North Midlands, fried or grilled oatcakes sometimes replace fried bread. The food is traditionally served with a mug of tea; more recently coffee is an acceptable alternative. 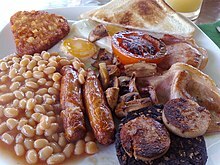 As nearly everything is fried in this meal, it is commonly known as a "fry-up". As some of the items are optional, the phrase "full English breakfast", or "full English" (or "Full Monty") often specifically denotes a breakfast including everything on offer. The latter name became popular after World War II after British Army general Bernard Montgomery (nicknamed Monty) was said to have started every day with a full English breakfast when in the campaign in North Africa. The traditional Cornish breakfast includes hog's pudding and Cornish potato cakes (made with mashed potatoes mixed with flour and butter and then fried), or fried potatoes alongside the usual bacon, sausage, tomato, mushrooms, egg and toast. In the past traditional Cornish breakfasts have included pilchards and herring, or gurty pudding, a Cornish dish similar to haggis, not to be confused with gurty milk, another Cornish breakfast dish made with bread and milk. "Irish breakfast" redirects here. For the tea, see Irish breakfast tea. In Ireland, as elsewhere, the exact constituents of a full breakfast vary, depending on geographical area, personal taste and cultural affiliation. Traditionally, the most common ingredients in Ireland are bacon rashers, pork sausages, fried eggs (or scrambled), white pudding, black pudding, toast and fried tomato. Sauteed field mushrooms are also sometimes included, as well as baked beans, hash browns, liver, and brown soda bread. Fried potato farl, boxty or toast is sometimes served as an alternative to brown soda bread. Limerick in particular has a long-standing traditional association with pork-based meat products. The "breakfast roll", consisting of elements of the full breakfast served in a French roll, has become popular due to the fact it can be easily eaten on the way to school or work, similar to the breakfast burrito in the United States. The breakfast roll is available from many petrol stations and corner shops throughout Ireland. A full Ulster fry served in Belfast, Northern Ireland. The potato bread is under the eggs, with the soda farl at the bottom. 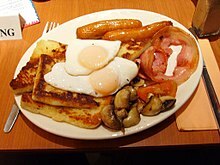 An Ulster fry is a dish similar to the Irish breakfast, and is popular throughout Ulster, where it is eaten not only at breakfast time but throughout the day. Typically it will include soda farl and potato bread. Similarly to the breakfast roll seen in the rest of Ireland, in Northern Ireland they serve "filled sodas", which usually consist of a soda farl shallow-fried on one side and filled with fried sausages, bacon or eggs. Fried onions or mushrooms are usually added upon request. Filled sodas are a popular choice for breakfast from roadside fast-food vendors. In Scotland, the full breakfast, as with others, contains eggs, back bacon, link sausage, buttered toast, baked beans, and tea or coffee. Distinctively Scottish elements include Scottish style or Stornoway black pudding, Lorne sausage, Ayrshire middle bacon and tattie scones. It commonly also includes fried or grilled tomato or mushrooms and occasionally haggis, white pudding, fruit pudding or oatcakes. As with other breakfasts it has become more common, especially within the home, to grill the meats, puddings and tomatoes and to only fry the eggs and tattie scones. Another more historical Scottish breakfast is porridge. Early editions of Brewer's Dictionary of Phrase and Fable referred to a Scotch breakfast as "a substantial breakfast of sundry sorts of good things to eat and drink". As in the rest of Britain and Ireland, the composition of a Full Welsh Breakfast (Welsh: Brecwast llawn Cymreig) can vary. However, with the new-found appreciation of Welsh food and recipes in the early 21st century, there have been attempts to establish a broad definition. The traditional Welsh breakfast reflects the coastal aspect of Welsh cuisine. As such it will typically include Welsh cockles and laverbread (a seaweed purée often mixed with oatmeal and fried). Both delicacies are traditionally served with thick bacon, but a Welsh breakfast may also include Welsh sausages, mushrooms and eggs. Full Welsh breakfasts are accompanied by traditional breakfast drinks, with Welsh tea a ubiquitous choice. Today, as they are often served throughout the day in public houses or inns, a traditional beer or ale is not uncommon. Modern alternatives to the traditional full breakfast will often develop the traditional seafood theme. Smoked fish such as sea trout or sewin may be served accompanied with poached eggs. This style of breakfast was brought over to the United States and Canada, where it has endured. A full breakfast in these countries often consists of eggs, various meats, and commonly one type of fried potatoes – hash browns, home fries, Potatoes O'Brien, or potato pancakes – and some form of bread or toast. Big breakfasts of this kind are most often served on special occasions or weekends only, owing to the time needed to prepare them and the calories involved. In the Southern US, grits are typically included. Typical breakfast meats in all of America are bacon, Canadian bacon, breakfast sausage, and ham. In Canada, peameal bacon or cretons are often served. Canada and the USA don't follow the trend of the rest of the Anglosphere where tea is the usual hot beverage for breakfast, but rather both strongly prefer coffee, drunk with milk, cream, or sugar. Maple syrup is common to both, with both nations having sugar shacks in their Eastern forests, Quebec producing the most. Both nations have diners, and there the most common components are eggs, bacon and/or breakfast sausage served with one or two of either toast, English muffins, hash browns, home fries, pancakes, French toast or waffles. Omelettes are a delicacy where anything goes, and several kinds of cheese are added to the mix depending on the desire of the cook, like cheddar, Colby, Monterey Jack, and feta. Eggs Benedict originated in New York and bagels wherever Eastern European Jews settled, but both are now a staple in both countries. There is also great regional variety. Oatmeal, made with rolled oats, is commonly served at breakfast in much of Canada and New England, but it is generally replaced by grits in the Southeast, where the climate is too warm for growing oats and eating oatmeal for breakfast has become more popular in that region only in the past 50 years. Biscuits leavened with baking powder or baking soda are a staple of the South and a component of biscuits and gravy. Country ham is very popular in every Southeastern state other than Florida and replaces Canadian bacon in recipes. Scrapple and pork roll are breakfast meats common to Pennsylvania, Delaware, and New Jersey, and the sausages eaten in Texas and Florida are usually a type of chorizo. Country fried steak is a dish that originated in Texas and steak and eggs are popular in much of the Midwest. The West is usually the home of dishes like migas, huevos rancheros, and the breakfast burrito, with all three spicy because they contain sizable amounts of chili peppers. Both coasts of Canada and the USA serve smoked salmon for breakfast and it is a staple in particular of First Nations of British Columbia. Eggs Sardou and Eggs Neptune are local variations on Eggs Benedict from Louisiana and Maryland, with each changing out the Canadian bacon with artichoke and crabmeat, respectively. Midwesterners used to eat calf brains with their eggs, and New Englanders will eat the johnnycake, and Spam is a staple of every Hawaiian plate. Californians invented the fruit smoothie. Juices vary with orange juice being the most popular, but also can be apple, cranberry, or pineapple. The full breakfast, usually referred to as a big breakfast, is common in Australia and New Zealand and is similar to British/Irish and North American variants, with some differences, having spread to Australasia when it was a part of the British Empire. Bacon, eggs, hash browns, and sausages are the most common aspects of the Australasian full breakfast. Tomato, barbecue and Worcestershire sauces are used frequently, as is cheese. Bread is used as the base for most breakfast dishes, however it is common to use bread (or toast) to make a bacon and egg sandwich. Breakfast muffins are an increasingly popular alternative to bread in the Australasian full breakfast. Regional variants are prevalent, with German influences particularly commonplace in South Australia. A few establishments in Hong Kong offer all day breakfast or brunch options (hybrid of English and North American items) from formal restaurants to low frills establishments. The ingredients of a full breakfast vary according to region and taste. They are often served with condiments such as brown sauce or ketchup. ^ "The full English". Jamieoliver.com. Retrieved 26 February 2014. ^ "Traditional Scottish Food". Visit Scotland. Retrieved 26 February 2014. ^ Rowland, Paul (25 October 2005). "So what is a 'full Welsh breakfast'?". Wales Online. Archived from the original on 2 May 2014. Retrieved 26 February 2014. ^ Bell, James (29 January 2014). "How to... Cook the perfect Ulster Fry". Belfast Telegraph. Retrieved 26 February 2014. ^ "The Traditional Full English Breakfast". The English Breakfast Society. Retrieved 20 January 2013. ^ "The Full English". Jamie Oliver.com. 29 March 2018. ^ "Stress-free full English breakfast". BBC. 29 March 2018. ^ "How to get all-you-can-eat breakfast with unlimited tea and coffee for just £5 in Coventry". Coventry Telegraph. 16 October 2017. ^ Mary Maddock. "Cornish Potato Cake Recipe – Cornish Recipes". Greenchronicle.com. Retrieved 20 January 2013. ^ The Ladies' Companion, December 1854, The Mercy of the Winter's Waves, (A Christmas Tale), by Silverpen. ^ "Traditional Irish Breakfast recipe from". Food Ireland. Retrieved 20 January 2013. ^ "Breakfast at Riva: full Irish breakfast". Riversidepark.ie. ^ Gerald, Paul (12 July 2012). "The Full English". Memphis Flyer. Contemporary Media, Inc. Retrieved 30 July 2012. The Irish might have soda bread, a potato pancake called boxty, white pudding (what you're used to, but with oatmeal in it) or black pudding (the same, but with blood cooked in). ^ "The silence of the hams". The Irish Times. 14 July 1999. Retrieved 24 June 2017. ^ a b c McDonald, Brian (12 May 2008). "Top breakfast baguette rolls into Irish history". Irish Independent. Retrieved 30 July 2012. ^ Gerald, Paul (12 July 2012). "The Full English". Memphis Flyer. Contemporary Media, Inc. Retrieved 30 July 2012. The Scots like to have tattie (potato) scones, fruit pudding (actually a sausage made with very little fruit), and, of course, their curse on the earth, haggis. ^ Elizabeth Foyster, Christopher A. Whatley (2009). A History of Everyday Life in Scotland, 1600 to 1800. Edinburgh University Press. p. 139. ^ Alan Davidson and Tom Jaine (2006). The Oxford companion to food. Oxford University Press. p. 185. ^ Brewer, E. Cobham. Brewer's Dictionary of Phrase & Fable. New York: Harper & Brothers. p. 812. ^ a b c "So what is a 'full Welsh breakfast'?". Wales Online. 25 October 2005. Archived from the original on 2 May 2014. ^ Welsh Government. "Wales.com – Food". Government of Wales. Retrieved 30 July 2012. Laverbread, not actually bread at all but seaweed, is rolled in oatmeal, fried into crisp patties and served with eggs, bacon and fresh cockles for a traditional Welsh breakfast. ^ "Hong Kong brunch: 10 best bargain all-day breakfasts". ^ "Hong Kong's best-kept secrets: all-day breakfasts for HK$48 in a sleepy border village". 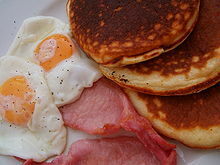 Wikimedia Commons has media related to English breakfast. Look up full breakfast in Wiktionary, the free dictionary. This page was last edited on 23 April 2019, at 06:05 (UTC).